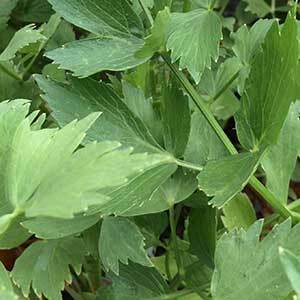 A perennial herb, Lovage (Levisticum officinale) is closely related to Parsley and Celery. It is stronger in flavour and smell however it is widely used as a culinary herb. With mid green foliage, the stems are interesting in that they are hollow. The stem, leaves and roots are all used in different ways. Its main use is in stews, however it is also used in bread making where the aniseed flavour adds a distinct taste. Sometimes the leaves are used in a salads and a purred of potato and lovage is found in some restaurants. The leaves are dried and used as tea. Because of the strong taste, this is a herb that needs to be used with attention to quantities. It is also used as a medicinal herb and is said to act as diuretic. Easy to grow from seed, and even easier by root division, Lovage is a tall growing herb that will reach nearly 2 metres in height before dying back in winter. Best grown in a humus rich moist soil, Lovage will grow in full sun to a little afternoon shade. Plants can be harvested twice a year for the foliage in good conditions.